One of the things I’m working on this year is to ensure that I’m eating healthier. Part of that diet is to eat enough protein during the day. Breakfast, lunch, and dinner all need to have protein, and I’ve been drinking protein shakes to boot. One excellent source of protein is chicken, and Tyson has some great chicken options. Last year, we had the chance to review Tyson Grilled & Ready Chicken Breasts. This past month, we’ve been able to try out another product from the Tyson Grilled & Ready family – their frozen Chicken Breast Strips. Tyson® Grilled & Ready Frozen and Refrigerated Chicken Fillets and Strips are fully cooked and perfectly portioned for your favorite recipes, hot or cold. They’re a delicious, healthy addition to salads, sauces and soups. Since they’re in a resealable package, you can use just what you need, and the rest stays fresh. Tyson® Grilled & Ready Frozen and Refrigerated Chicken Fillets and Strips make it easy to add variety to party appetizers or dinner. They’re everything you love about fresh chicken ready in half the time. 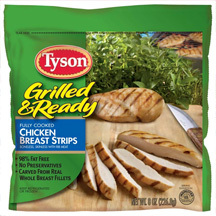 When it comes to convenience, you can’t get much easier than Tyson Grilled & Ready Frozen Chicken Strips. They arrive fully cooked so all you need to do is to heat them up – either stove top or in the microwave. What I discovered this time was how flexible they could be used in your dishes. The most straightforward way to use the Tyson Grilled & Ready Frozen Chicken Strips is on a salad, which I did. Here you can see how the strips look in the pan, followed by how delicious they are on top of my salad. But these convenient chicken strips can be use for just more than a salad topper. You can cook them up with your pasta as a meaty addition to the meal. 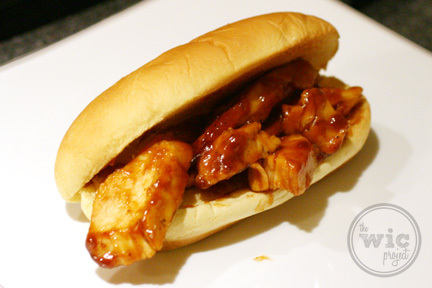 One night, I decided to live on the edge a little bit and made a BBQ chicken sandwich with them. First, I put some Tyson Grilled & Ready Chicken Breast Strips into a small pan. I then poured/squeezed out some BBQ sauce into the pan, making sure that each piece of chicken had a nice coating of BBQ sauce. Then I just followed the cooking instructions, just heating the strips over medium heat for 3 to 5 minutes. Throw the chicken on a bun, serve with some beans, and you have an awesome BBQ chicken sandwich cooked in just a few minutes. Then, another night, when I was running REALLY low on food, I took the chicken strips, heated them up in the microwave for a few minutes, dipped them in butter, then coated them with Italian herb breadcrumbs. 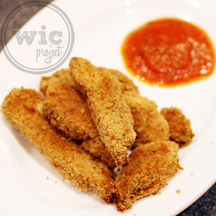 After breading, I baked them in the oven at 350 for about five minutes and served them with spaghetti sauce. It was delicious. I think next time, I’ll probably dip the strips in egg instead of butter, but as I said, I was low on food and didn’t have any eggs. The finished strips were very tasty. They were moist and juicy even after being nuked and then baked. This is an easy way to make some tasty appetizers for a party or as fun finger food for the kids. For someone who is working to add protein into their meals, without adding extra fat or calories, the Tyson Grilled & Ready Chicken products are such a great option. One serving of the Grilled & Ready chicken breast strips is just 100 calories and provides 21g of protein. Tyson Grilled & Ready Frozen Chicken strips also have no preservatives. They’re carved from real chicken breast fillets – no mystery chicken mush here. When you cut the chicken strips or bite into the chicken, you can tell that you’re biting into real meat. Tyson Grilled & Ready Chicken products are available in stores nationwide in the frozen or refrigerated chicken sections. Make sure you visit the Grilled & Ready website to download a coupon for $1.00 off one bag of Frozen Tyson® Grilled & Ready® Chicken Fillets or Strips. One winner will receive two (2) coupons for FREE Tyson Grilled & Ready product! Visit www.grilledandready.com and leave a comment with the Tyson Grilled & Ready product you want to try the most or a recipe that you would like to cook up. Giveaway ends at 11:59 PM EST, April 25, 2011. I’d love to cook up the grilled chicken caesar salad with these strips. i’d like to try the grilled breast supreme or just make chicken quesidallas. I would like to try Seasoned beef strips. 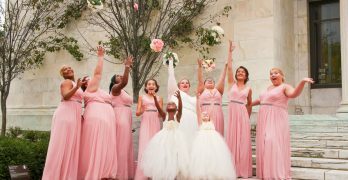 I follow you on Twitter, click my name ^ to take you to my page. AWESOME giveaway! I’m all for anything that makes dinner prep quicker!! I’d want to use the grilled chicken strips in a stir fry with lots of veggies. Or in a pasta dish with a creamy alfredo sauce. YUM! anddddd I get (and have been getting) your posts via google reader. Thanks again for hosting a great giveaway! I’d get the fully frozen cooked chicken breasts. I’d love to try the Grilled and Ready Seasoned Beef Strips! The Seasoned Beef strips is the product I would like to try the most. They look so good on the package! I’d love to try the recipe for Sesame Chicken Slaw. Thanks. I would use the grilled chicken strips for quesidillas. I’d like to try the Broccoli, Chicken and Rice Casserole recipe! The Grilled and Ready Greek Steak Salad caught my eye. DH is a lover of Greek pizza and Greek style chicken, so I think he would really like this. I’d have to skip the red pepper hummus, though, and choose something less spicy for me. I’m a spice whimp. This would also most likely taste good with chicken in place of the steak. I “follow” The WiC project on Twitter @oneinpurpose. I subscribe via email, too! I would like to try the fajita chicken strips. I’d like to try the Grilled Chicken Tacos recipe, using Tyson’s Boneless, Skinless Chicken Tenderloins. That served with cold Mexican beer, and Herb Alpert’s Tijuana Brass on the stereo. Ole! I would like to try the Fajita strips. I like their bagged Honey BBQ wings. I follow Dealicious Mom on reader. Like to try the Southwestern chicken strips.. I would like the fajita chicken breast strips. I’d like to try the Tyson Seasoned Beef Strips. I would like to try the Grilled & Ready™ Refrigerated Fully Cooked Southwestern Chicken Breast Strips. I would use the grilled chicken strips in Fettucini Alfredo – toss in some frozen broccoli and you’ve got a meal! I would love to try the Broccoli, Chicken and Rice Casserole. I want to try the Grilled & Ready™ Fully Cooked Southwest Chicken Breast Strips the most. I want to try their Grilled & Ready™ Refrigerated Fully Cooked Southwestern Chicken Breast Strips in a burrito with guacamole, onions and bell peppers. I would like to try the seasoned beef strips. I would love to make the recipe for the Easy Fiesta Chicken Appetizer Squares. I would actually like to try the Tyson Grilled Chicken Strips. It would go great in my Ceasar salads. Thank you for the chance to win! 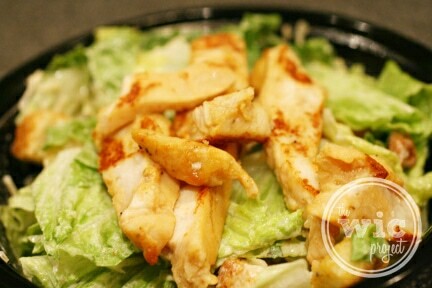 I’d love to try the Southwestern Breast Strips and I’d probably put them on top of a Ceasar salad! would like to try the seasoned beef strips. I’m subscribed to your RSS feed via Google Reader already. I think I would like to use these chicken strips to make a nice Caesar Salad. They sure would cut time and make it really speedy. Haven’t bought this Tyson product before but the Steak Strips also look yummy. Email subscriber to your updates. I’d like to cook the Lemon Dijon Chicken. I’d like to try the Chicken Fajita Casserole recipe. I would love to try the Seasoned Beef Strips and the Fajita Chicken Breast Strips. Thanks for the giveaway. I’d like to try the Seasoned Beef Strips. 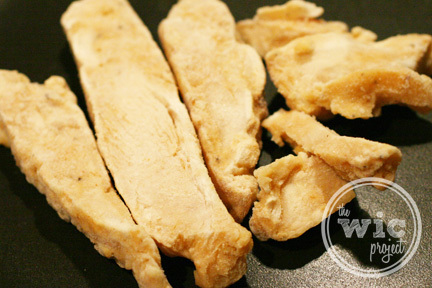 I’d like to try this – Southwest Chicken Breast Strips. I’d love to use these to make fajitas. I’d like to try the recipe for Greek Steak Salad. I’ll anything with chicken – I LOVE IT!!! I would try the Lemon Dijon Chicken recipe. These guys, http://www.tyson.com/Consumer/Products/ViewProduct.aspx?id=287 sound like they’d be delicious and save me the trouble of firing up the grill when the weather is bad outside. I really want to try the chicken breast fillets! They look scrumptious! I would love to try the Southwestern Chicken Breast Strips…these seem perfect for the simple but delicious meals! Thanks for the giveaway! I would love to try the fajita chicken strips. We are reallly tight on money right now and these coupons would be a huge blessing! i would love to try the Tyson® Fresh Boneless, Skinless Chicken Breasts in the chicken breast supreme recipe! I really would like to try the seasoned beef strips. I use the grilled chicken strips in a pesto pasta. 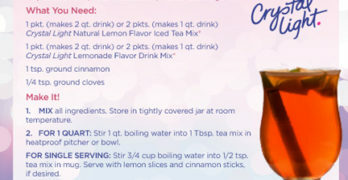 It is quick, easy and yummy. I would like to make the Chicken Fajita Casserole recipe! I’d like to try the fajita chicken breast strips. My family loves fajitas! I would like to try the Fajita Chicken Breast Strips. I’d like the chicken breast strips. I tried the grilled and ready chicken strips and initially agreed that they were quick, convenient and tasty. However, when I heated some of the smaller bits in the toaster oven for quesadillas, I found that I had mostly fat to put in my recipe. Lots of fat. When I sorted out the actual chicken pieces, there was about 1/3 of the volume to throw out: fat!